Hungarian rabbi and Talmudic author; born in Raudnitz, Bohemia, about 1812; died at Balassa-Gyarmath, Hungary, April 26, 1878. He received his early education under his grandfather, Joseph Deutsch, who was rabbi in Raudnitz, and then frequented the yeshibot of Prague and Presburg, being one of the favored disciples of Moses Sofer. He lived subsequently in Irsa, where he married, and after the death of his wife moved to Budapest, where he lectured on Talmud to a small society. In 1846 he was called as rabbi to Sebes and in 1851 to Balassa-Gyarmath, where he officiated till his death. In the Reform movement, which began with the Hungarian Jewish Congress of 1868, Deutsch was one of the most uncompromising leaders of Orthodoxy; and to his efforts the legal recognition of the autonomy of the Orthodox congregations in Hungary was largely due. He was a great ascetic, and was in sympathy with the Ḥasidim, although he did not adopt all their tenets. As typical of his views may be quoted the facts that he declared it sinful to pray in a synagogue in which the almemar was not in the center, and that he prohibited the winding up and setting of an alarm-clock on Friday so that it should ring on Saturday. 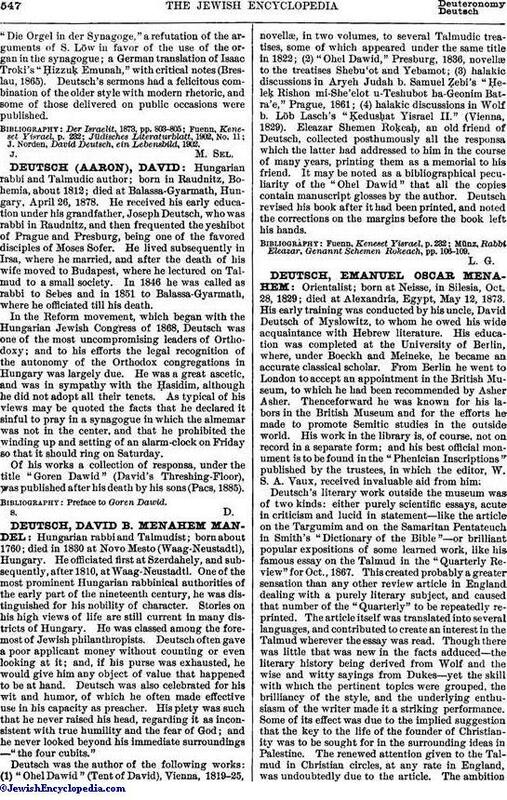 Of his works a collection of responsa, under the title "Goren Dawid" (David's Threshing-Floor), was published after his death by his sons (Pacs, 1885).